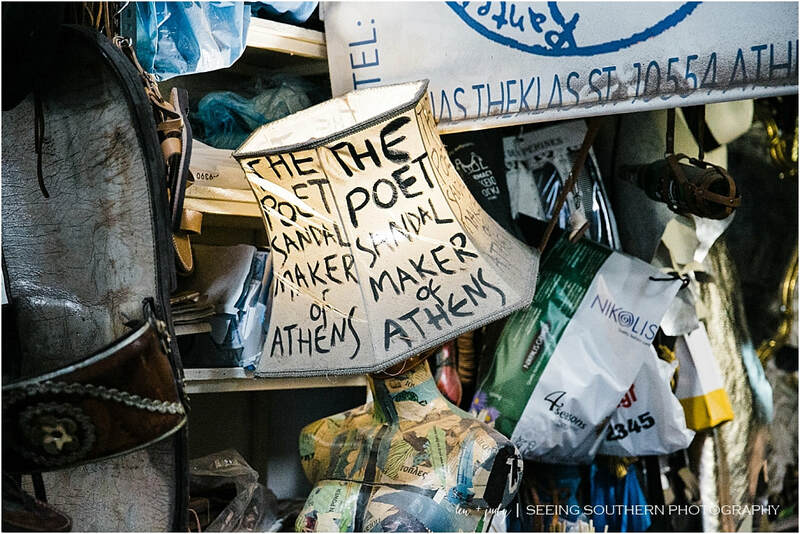 It was the pop-up shop just around the corner from the Parthenon Hotel in Athens that first caught my attention. All things leather. Bags, shoes, pouches, sandals, backpacks. Enough leather to make a person - or at least someone like me - swoon. With a little more discovery, turns out, the shop was solely advertisement. Theworking shop for the leather artist would take more effort and a journey into the heart of the city of Athens, Greece. After about a 45-minute walk, we turned the corner, and the building-high sign told us we were there. Pantelis Melissinos, The Poet Sandalmaker. The tiny space would have competed with the size of my bedroom at home. Walls filled with abstract art, famous photographs of clients endorsing sandals, and a endless stream of people from all over the world coming in and out of the shop made me wonder if we should come back. With only fifteen minutes until closing, we are told that the crowds are always there and the wait is always worth it. We angle in the doorway, and I sit. Len tells the man (who only speaks Greek) that we're looking for the moment. Neither of us knew the protocol, so we watched. At least 15 people were squeezing into a space that might have accommodated seven. Finally, an American woman told us to pick out a shoe (samples on the wall) and they would fit my the pair to my feet. She handed me her catalog that was filled with stories of three generations of sandal makers who has outfitted everyone from John Lennon to to Prince Charles to Jackie Kennedy to Sarah Jessica Parker. Letters of appreciation in a multitude of foreign languages covered the pages, all thanking him for fitting them with their own personal style. For me, it would be the John Lennon. The worker brought the shoe, placed it on my foot and measured and stamped and then measured more. When he had it about right, he handed it to Pantelis Melissinos who sat at his workbench behind the people who were waiting. He sat on a swivel stool, turning one way or the other to grasp what he needed. With tools he began attaching the final hardware and his stamp to the leather. He talked with Len as he worked, telling of his pride of his family's generational craftsmanship. The business was founded by his grandfather, Georgios Melissinos in 1920; then, it was passed down to his son Stavros who then passed it down to Pantelis in 2004. He states in his catalog, "We are always solicited for mass production, we have proposals coming from the United States, Korea and Japan," he says. "But it's not our style. Every single pair is finalized on the customer's foot." He uses calf leather from Northern Greece, and it is tanned in Crete. 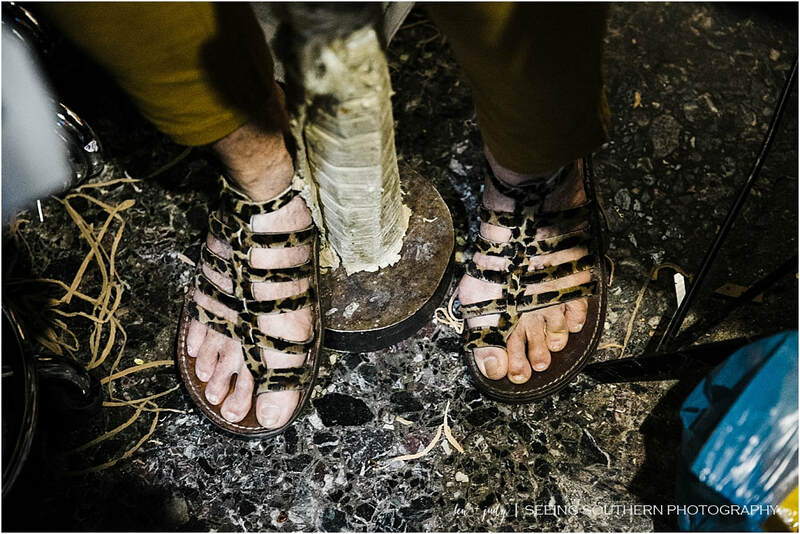 Making thousands of sandals each year, he keeps them modern yet traditional. "I don't follow fashion trends," he states, "There is a sandal revival . . . it's a riot." There are also special orders which span the color realm, like art for your feet. Like the ones he wore on his feet that day. Shortly after we sat down in the shop, they locked the door. Someone said they had to or people would continue to flock in. About 30 minutes after entering, I walked out of the shop, proudly clutching my original Greek sandal made by the historic Greek sandalmaker.